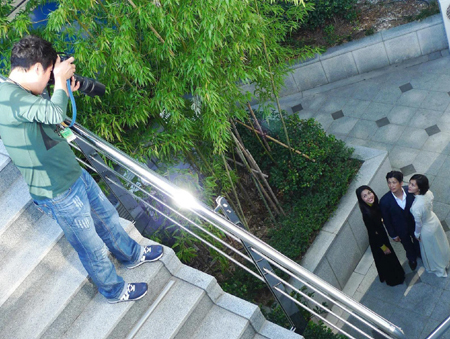 Recently, in the hectic midst of press releases and foreign fan meetings for the Pusan International Film Festival in Korea, the crew representing Vietnamese film feature, Canh Dong Bat Tan/The Endless Field (English name Floating Lives) , had to endlessly answer questions and strike poses for the cameras. Well it seems the ‘answering and posing’s went to good use. This morning, October 11, actor & actresses Dustin Nguyen, Tang Thanh Ha, & Do Hai Yen was spotted on the cover of famous Korean cinematic magazine titled Cine21 and another called The Daily Pusan. 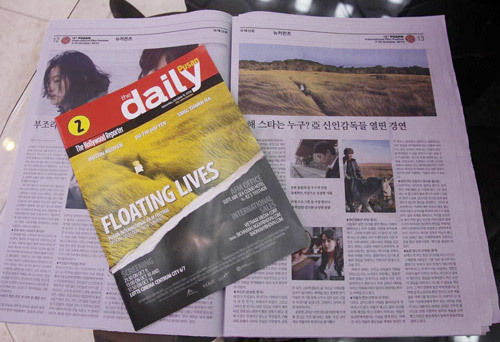 Both magazines featured coverage on the movie The Endless Field, director Nguyen Phan Quang Binh‘s on-screen adaption of an award winning novel by Nguyen Ngoc Tu, while also noting its favorable running for the New Current award which is to be announced on October 15. Wow, I want to watch this. Looks really good. Anyways, I think it’s great news that Vietnamese films are getting more international attention. not that I don’t support this film, doesn’t look too bad, but out of the tons of high budget projects out this year why does this film get the honor? do the director/crew have connections? considering the lead actor is Dustin Nguyen, I’d say yeah, they have connections. But connections only get you through the door. The film has to still live up to the hype. While Dustin Nguyen is a great actor, Vietnam’s movie industry still needs more male actors! Dustin is like in every movie ….